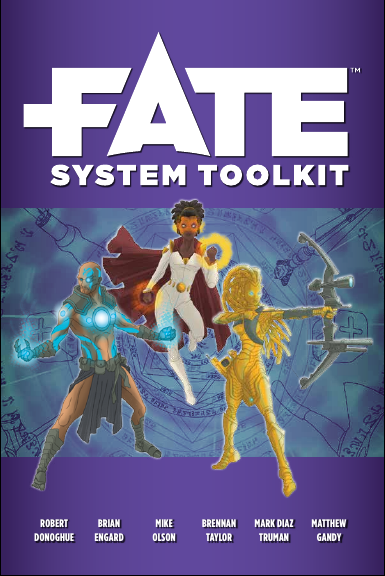 Instead of continuing with my design posts, I’ll pause to rave about the Fate System Toolkit, Evil Hat Productions’ supplement for the Fate system. I have read it twice in its entirety now, and I’ve thumbed through a lot as well. This book was designed for people like me: people who like to understand why things work a certain way, and how you can adjust them to suit your needs or whims. The layout is the same clear and crisp one used in Fate Core and Fate Accelerated; like in these two books as well, the illustrations are excellent. The art is also kept thematic by having a given artist illustrate an entire section rather than mixing and matching throughout. As a result, not only does the book get a nice unified feel but you get a sense of the stories or campaigns behind a collection of illustrations that just make you want to find out more about the game they evoke. As for the physical item, I’m a sucker for the high-quality finish of the hardback book, the same as Fate Core hardback; yes, I like to handle the cover and pages. The writing style is clear, direct, conversational, and I found it easy to grasp the explanations. The examples provided throughout pull the double duty of providing clarity and generating sparks of ideas for your own games. This is a brilliant, comprehensive, well-explained collection of ideas for adjusting the Fate rules to do all sorts of wonderful things for you. It provides the why, why not, and how of a ton of adjustments that will allow you to implement just about any genre or flavour in your own campaigns. What if you want to play a dark, gritty setting? What if you want to play Doc Savage-style high pulp, or superheroes, or low fantasy, or horror? Here are the dials for you to adjust, and here are the base settings. As you thumb through, you will keep finding new ideas and getting flashes of the cool games you could run with them. Most of the ideas can be readily implemented in both the Core and Accelerated builds. In combination with one of the Fate rulebooks, it is tremendously useful in order to fine-tune a campaign. Perhaps what I like best is that the reasoning behind every rule is explained so that you can get a sense of how changes will impact the game. This is similar to another toolkit I dearly love, Steve Kenson’s Mastermind’s Manual for Mutants & Masterminds (Green Ronin Publishing). I’m at a loss to find something to criticize, except on the order of “You omitted a topic I have a question on” or “I wanted this section to be longer.” Given that the possible topics are nigh-infinite and the entire book issued from the Fate Kickstarter like Athena from the forehead of Zeus when it was only supposed to be a chapter of Fate Core, I don’t know how I could find fault there. Since it’s available in PDF, ePub and mobi formats on the pay-what-you-like model, I see no reason a Fate gamemaster would deprive herself of this resource. If you tinker with your games and you like a toolkit approach, you need this book. Posted on November 20, 2013 November 20, 2013 by mechanteanemonePosted in books, games, Reviews, rpgsTagged books, design, Evil Hat Productions, FATE, Fate Accelerated, Fate Core, Fate System Toolkit, games, reviews, rpgs, writing.